Review: "Osibisa: Osibisa/Woyaya (reissues)" - Sea of Tranquility - The Web Destination for Progressive Music! 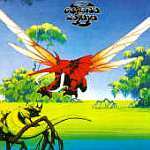 Much more than just another band that Roger Dean did album cover artwork for, Osibisa's first two releases are extremely enjoyable journeys into the world of African and West Indian music, much of which incorporated funk, jazz, progressive rock, and Latin tinged acid rock. Osibisa started off as a seven-piece unit, comprised of musician's from Ghana, Grenada, Antigua, Trinidad, and Nigeria, and the band mixed woodwinds, brass, keyboards, guitars, bass, and loads of percussion like no other band before them, save for perhaps Santana. The result on these first two albums rocked, grooved, and meditated, and did it real well. The first self-titled album is made up of lots of extended jams and funky passages, highlighted by bluesy yet ripping guitar work, jazzy horns and reeds, pulsing bass, and various kinds of tribal percussion. Tunes like "Ayiko Bia", "Dawn", and "Akwaaba" really rock, yet have the psychedelic jam quality that early Santana had (in fact, guitarist Wendell Richardson sounds somewhat similar to Carlos Santana) mixed with lots of jazz influences. Thick slabs of organ can also be heard throughout, courtesy of keyboard player Robert Bailey, who also adds some timbale and piano. While there are vocals from time to time, the music is mostly instrumental. Woyaya is a bit different than the debut album, more percussive and meditative in nature, and certainly less raucous, but much more rhythmic. "Y Sharp" is a funky rock song with raging sax and trumpet, as the band comes across a bit like early Chicago, and on "Spirits Up Above" they settle in for some slow blues led by Hammond, sax, and an emotional choir. The arrangements are much tighter on Woyaya, as evident by the funky rockers "Move On" (featuring great guitar work from Richardson) and "Survival", but there's also a fair share of looser, more jammy tracks, like on "Rabiatu", "Beautiful Seven", and the closing title track. I'll also point out that this one is much more vocal oriented than the debut. For my money, I prefer the debut album just a tad, as I like their more aggressive and risk taking style on that one, but both are well worth having regardless. Both albums are available now from AIM Records out of Australia, and well worth adding to your collection.